FILE - Democratic presidential candidate Hillary Clinton gestures at the audience as he arrives at a campaign event at the Florida State Fairgrounds Entertainment Hall in Tampa, Florida, July 22, 2016. Debbie Wasserman Schultz quit the post amid a furor over leaked emails that show party leaders mocked and criticized the upstart campaign of Vermont Senator Bernie Sanders, while he was waging an unexpectedly tough challenge to Clinton for the nomination. Wasserman Schultz, a U.S. representative from Florida, was expected to officially step down at the end of this week's convention in Philadelphia. Sanders had demanded that Wasserman Schultz resign after WikiLeaks disclosed nearly 20,000 emails from Democratic Party leaders over the last year and a-half. After her resignation was announced, Sanders issued a statement saying, "Debbie Wasserman Schultz has made the right decision for the future of the Democratic Party. While she deserves thanks for her years of service, the party now needs new leadership that will open the doors of the party and welcome in working people and young people. The party leadership must also always remain impartial in the presidential nominating process, something which did not occur in the 2016 race." 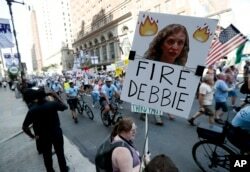 A supporters of Sen. Bernie Sanders, I-Vt., holds up a sign call calling for Debbie Wasserman Schultz, chairwoman of the Democratic National Committee to be fired, Sunday, July 24, 2016, in Philadelphia. In a CNN interview, the Vermont senator called the comments in the emails "outrageous," but said he was not shocked by them, adding "It's what we talked about six months ago, that the (Democratic National Committee) was supporting Hillary Clinton and was opposed to my campaign." As news of the emails emerged, Wasserman Schultz told associates she would neither speak at the convention nor preside over it. Later she announced she would resign as DNC chair. Clinton issued a statement saying, "I am grateful to Debbie for getting the Democratic Party to this year's historic convention in Philadelphia, and I know that this week's events will be a success thanks to her hard work and leadership. There's simply no one better at taking the fight to the Republicans." The convention opens Monday in Philadelphia, known as the City of Brotherly Love. More than 5,000 delegates are among the 50,000 people set to attend the gathering. Clinton campaign manager Robby Mook suggested that "Russian state actors" stole the emails and released them as the Democratic convention was convening, in an effort to help Republican presidential nominee Donald Trump, but he offered no proof. The Trump campaign called Mook's assertion a "joke." After the long Democratic fight for the nomination, Sanders endorsed Clinton and is speaking Monday at the convention on her behalf, as is first lady Michelle Obama. Sanders said he will "do everything I can to make sure" Trump does not win the November national election to pick the successor to President Barack Obama. A fixture on the American political scene for decades, Clinton is headed to the party's quadrennial convention after naming Virginia Senator Tim Kaine as her vice presidential running mate. Trump and Clinton both are viewed unfavorably by more than half the American electorate, polls show, with Trump more so than she is. She holds a slight edge in national political surveys over Trump, three and a-half months before the election. Since turning his attention away from his Republican presidential primary opponents and toward Clinton, Trump has labeled the presumptive Democratic nominee "crooked Hillary." But in an interview aired Sunday on CBS TV's "60 Minutes," Clinton asserted she will not engage in the kind of "insult fest" she said Trump "seems to thrive on." Instead, she said her campaign will focus on the kind of "dangerous, risky leadership" that a Trump presidency would bring.